Bathed in morning light a plate of newly baked bagels waits to be scoffed! It took an age to incorporate all the flour by hand but I didn’t add any extra water. I couldn’t knead the dough to a windowpane stage, you have to be joking! That’s the hardest dough I have ever tried to mix. So I kneaded the dough 3 times over the space of an hour and a half instead. I made the dough, shaped the balls, used the poke and stretch and hula hoop method to shape them. Tried the water test on one, after an hour, which promptly turned into a saggy stretched monster. So I didn’t try that again and put them in the fridge overnight. ..Threw loads of spraymalt and the dregs of a jar of malt syrup into the jam pan full of boiling water. Boiled the bagels two at a time for a minute each side, then out and face down in the seeds and onto a tray and into a very hot oven about 260 C for a good 15 minutes till they were a good golden brown. They didn’t float in the water, in fact they all went to the bottom and stuck slightly! But I eased them off and then once they had been flipped they bobbed about quite happily. These were 100 per cent better than my first attempt. 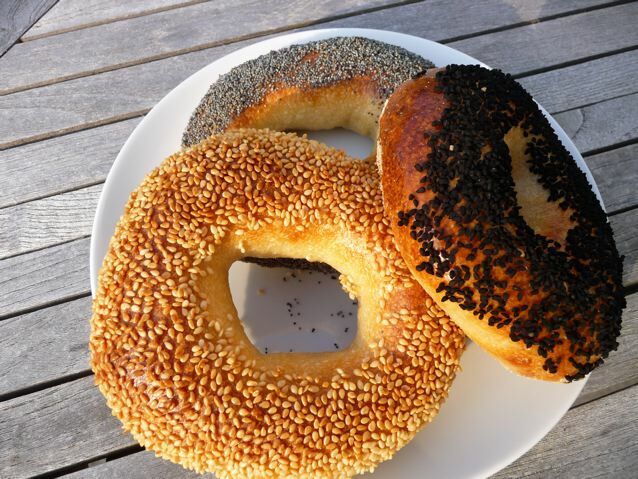 I don’t think we have quite got it right, but these had a good flavour, shiny outsides and were definitely cooked, chewy, holey, slightly sweet and I recognised their Bagel Nature. Thanks Paul for the instructions and encouragement. For the recipe and method click here on his blog! 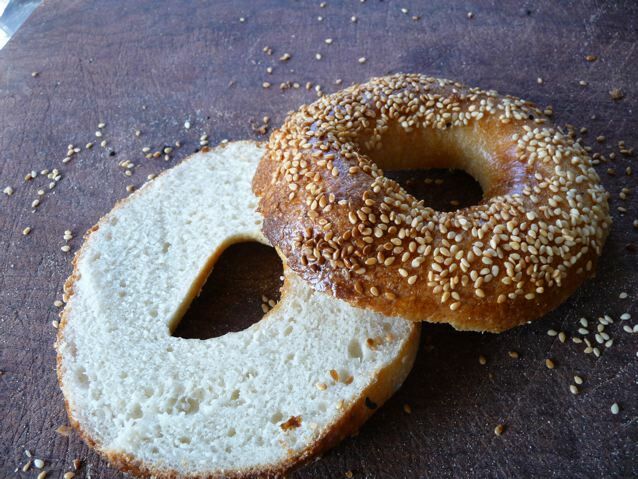 This entry was posted in Bread and tagged baking, Bread, sourdough bagel, yumarama on 19/04/2010 by Joanna. They look great and sound like they have the right consistency.